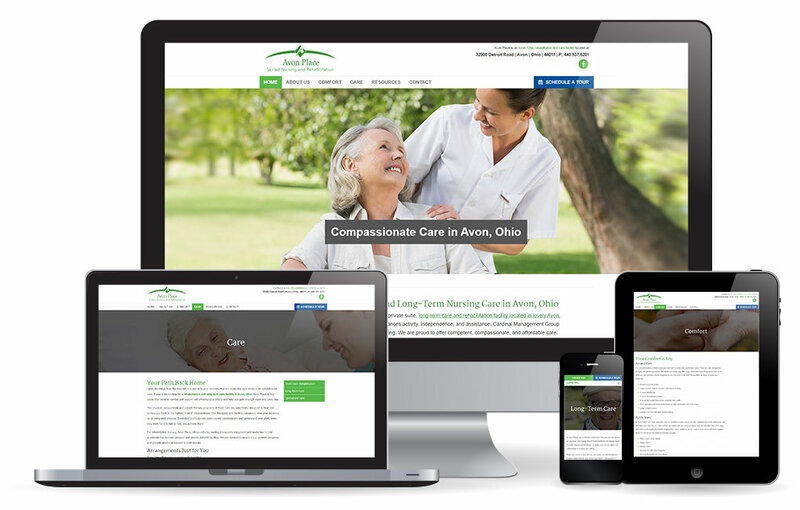 Avon Place Skilled Nursing and Rehabilitation Center is a specialized care facility located in Avon, Ohio. Avon Place offers 24/7 nursing professionals, in-house physicians, a state-of-the-art therapy gym and much more. With an upcoming remodel, Avon Place requires a new website that is up-to-par with the new facility. It is imperative that both short and long-term care services are promoted via the new website, as well as the various specialized care options. For optimal success and a quick ROI the new website must generate leads and help the staff at the facility to convert them into new patients. We developed a clean and elegant responsive website for Avon Place. Using our information hierarchy we positioned each service so that it is aligned the Avon Place’s business objectives. We helped the 95-bed facility promote short-term rehabilitation, long-term care and specialized care. The new website also uses calls to action to help drive website visitors to engage the facility and submit their contact information. We also implemented a search engine optimization strategy that quickly promoted Avon Place on the first page of Google for organic search.